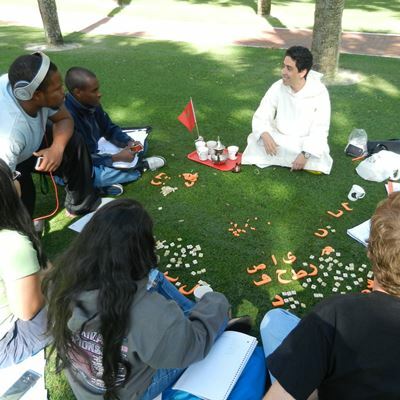 Holding Arabic 101 class outside, Fulbright professor Abdelaziz Khourdifi enjoys Moroccan tea and the warmth of the Sunshine State with his students. Arabic, a Semitic language, is spoken by more than 300 million people in the world. In addition to being the official language of more than 20 countries, it is also an official language of the United Nations, Organization of Islamic Conference, and The Arab League. Arabic is the language of a great civilization that had a great influence on other civilizations during the Islamic golden age, when Arabic became the medium of mathematics, philosophy, science and medicine. Based on the aforementioned facts, Arabic remains a vital language worthy of being learned. Due to booming commerce, international relations, trade, and other factors Arabic has become an essential instrument in a globally competitive world. In the USA, more and more universities are offering Arabic as a foreign language in their foreign language programs among other languages as French, German, and Spanish. 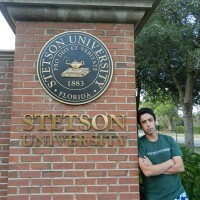 Of course, Stetson University in Florida is not an exception. Stetson University has the mission, in partnership with the International Institute of Education and the U.S. Department of State’s Bureau of Education and Cultural Affairs, to make learning a foreign language a unique and vivid experience, bringing native speakers from their home countries to teach their mother languages and cultures. In this regard, Fulbright scholars have contributed and participated in teaching a number of languages in American universities. Among the languages taught by Foreign Language Teaching Assistants (FLTAs) at Stetson University is Arabic. In addition to teaching language components of Standard Arabic, it is necessary to open students’ minds to different aspects of the Moroccan culture, including but not limited to history, customs, traditions, religion, and politics. Not only do students learn about these aspects as observers, but they live them sprightly from within. In fact, in many occasions cultural classes are held for the purpose of raising students’ awareness to the aforementioned aspects. Students love to be engaged in such vivid discussions and to hear from a witness belonging to the target culture being discussed. These discussions help with undoing and breaking the stereotypes and prejudices some students might have about the target culture and to show and share the ties that link different nations and cultures. A simple example could be the old ties between Morocco and the United States. A few students know that Morocco was the first country to recognize the United States’ independence in 1777. Both countries also signed the Moroccan American friendship treaty, which remains the longest, unbroken treaty in American history. Worthy of mentioning here is the strong desire of Stetson students to explore and learn a language that has always been viewed as being difficult and hard to learn. In this vein, contradictory outcomes related to English and Arabic helps effectively with predicting where students may have some difficulty. What students appreciate more in learning Arabic at Stetson is the way it is taught. That is, Arabic is taught using the most innovative methods in foreign language teaching, without neglecting some effective techniques from the “old methods”. In this regard, it may be claimed that the methods used to teach English can be applied in teaching Arabic or any foreign languages. The use of games is a highly favored technique in language learning. Students love to combine learning with playing and certainly they enjoy learning by doing. Making words out of scrambled letters remains one of the favorite activities of my students of Arabic 101, and in a similar way, for my students of Arabic 102, making sentences out of scrambled words. These activities are more effective and funny when they are held outside the classroom, where students enjoy the warmth of the Sunshine State while focusing on their tasks. One day, we held a class outside and students were actively engaged in different activities, and enjoyed sipping original Moroccan tea from an original teapot. Evidently, Standard Arabic is the language being taught in this context, but with minor focus on Moroccan Arabic, Darija remains the main vehicle of daily communication in the daily life of Moroccan citizens. Moroccan Darija is slightly different from Standard Arabic in the sense that the former is a mixture of other languages like Tamazight (Berber), French and Spanish, while the latter has scarcely changed throughout history. It is the language of revelation and of the holy Qur’an. Unlike Moroccan Darija, Standard Arabic is barely used in speech. Rather, it is used in other domains, namely in administrations, media, education, to name but a few. Based on the aforesaid fact, it is necessarily relevant to incorporate activities in the syllabus that pivot around the Moroccan Darija. With respect to learning Moroccan Arabic, students have to come up with their own projects in Darija. They have to create situations where they will use Moroccan Darija in an authentic context. Some choose to have a dialogue in a Moroccan store (Hanot), where some of them play the role of the grocer, while others assume the role of clients. The results are unexpectedly amazing and stunning. A group of students created a situation in one of the stores of the university, where they played roles of waiters and clients. What is striking about this dialogue is the amount of cultural elements students have put in it, incorporating successfully culture into language, which rendered it into a vivid experience. They used different styles of Moroccan music, including Gnawa, and Andalusian music in addition to wearing native-like clothing style. Addressing different learning styles is of paramount importance in teaching any language. Different activities, including games, visual aids, videos, songs, group work, are designed to meet the goal of responding to students’ learning styles. The use of visual aids, in particular, is extremely important in explaining different language items in a clear and concise way. For instance, explaining some words that are strongly tied to the culture is not an easy task to undertake unless students see these items in a concrete way. Words like Jelab, Balgha, and Sabniya, words deeply rooted in the culture, are a bit hard to explain using only words. Undoubtedly, learning a language has a great influence on how students perceive and interact with the world around them. It is a process whereby students acquire the skills and the potential necessary to merge into a globally integrated and interrelated world. My own experience as a Fulbright teaching Arabic has almost come to an end, but my ties will remain undoubtedly strong with my students, faculty, students with whom I took some classes, and students with whom I met in different activities held inside or outside Stetson University.